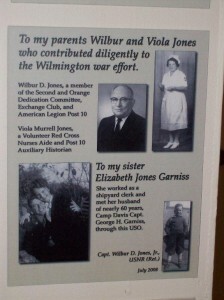 WWII Wilmington Home Front Heritage Coalition – Wilbur Jones Compositions, L.L.C. The Coalition is an all-volunteer, 501(c)(3) preservation organization whose mission is to identify, preserve, and interpret the rich World War II legacy of Southeastern North Carolina. 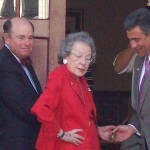 Contact Chairman Wilbur Jones via phone at 910-793-6393 or via email at JonesWD@aol.com. Dedication of giclee of the National World War II Memorial in Washington, D. C., and first North Carolina screening of documentary on the military career of Wilmington WWII Medal of Honor recipient, Charles P. Murray, Jr.
On February 23, the Coalition dedicated the giclee and installed it in the lobby home front museum of the Hannah Block Historic USO/Community Arts Center, at Second & Orange Streets. 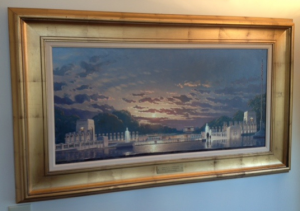 The giclee, produced by the original’s artist John M. Barber (oil on linen) for the Memorials dedication in 2004, was donated by Wilmington resident COL Kenneth S. Pond, USA (Ret. ), former executive director and chief operating officer of the American Battle Monuments Commission – the man who built the Memorial. He was the keynote speaker. The Murray documentary was produced by South Carolina public television (etv) in 2012, and features a recap of his Medal of Honor action near Kaysersberg, France, in December 1944. Murray (1921-2011) graduated from New Hanover High School in 1938 and is buried in Arlington National Cemetery. 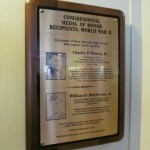 On November 3, 2012, the Coalition dedicated plaques to (1) New Hanover High School graduates Charles P. Murray, Jr. (1938), and William D. Halyburton, Jr. (1943), who received the Medal of Honor, and (2) to the 248 County armed forces men who died. Other new exhibits included the remnants of a champagne bottle which launched the Liberty ship SS Roger Moore at the Wilmington shipyard in 1943, and accompanying photo of th Moore family “launching team”; the Coast Guard uniform of Wilmingtonian Swift Boatwright; and the WWII decorations and memorabilia of Wilmingtonian John J. Burney, Jr., who fought with the 63d Infantry Division in France and Germany, including original paintings of his unit in combat scenes painted by a French artist friend. On February 27, 2013, in the 1st session of the 113th Congress, Congressman Mike McIntyre (7th District, N. C.) introduced (sponsored) H.R. 864 in the U.S. House of Representatives. H.R. 864 would “direct the Secretary of Veterans Affairs to designate at least one city of the United States each year as an ‘American World War II City,’ and for other purposes.” Those purposes would establish criteria for selection – contributions to the war effort, and preservation efforts since – and designate Wilmington as the first. McIntyre, who represents parts of Wilmington and New Hanover County, has strongly supported Coalition preservation efforts for years. He is joined as principal co-sponsor by Congressman Walter Jones, whose 3rd District also includes parts of Wilmington and New Hanover County. McIntyre is seeking additional co-sponsors. 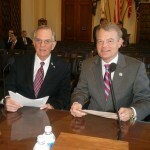 In April 2012 the House Committee on Veteran’s Affairs passed H.R. 4072, a composite bill containing the appropriate portions of Congressman McIntyre’s original bill, H.R. 2717 (which had 66 co-sponsors). It essentially would have accomplished the same as H.R. 864. H.R. 4072 did not reach the House floor for a vote before the 112th Congress adjourned in December. 2013 action in the Senate is pending awaiting House action. We have worked with the staffs of N. C. Senators Richard Burr and Kay Hagan on their support for a companion bill or a plan to move it forward once it reaches the Senate. Senator Burr is the ranking member of the Veterans Affairs Committee, to which such legislation would likely be referred. Click the image to view full screen. The following is the Testimony of Captain Wilbur D. Jones, Jr., USNR (Ret.) Chairman World War II Wilmington Home Front Heritage Coalition, from March 29, 2012. 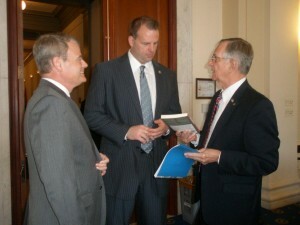 U.S. Rep. Mike McIntyre (7th District-N. C.), left, and Captain Wilbur Jones visit with Rep. Jon Runyan (N. J. 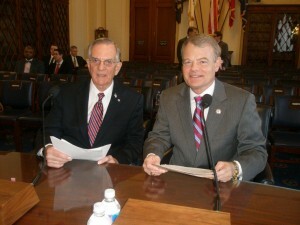 ), before testifying at the hearing on McIntyre’s Bill, H.R. 2717, at the Cannon House Office Building on March 29. Jones presents a copy of his “Football Navy! War!” book to Runyan, a retired NFL lineman and 2000 Super Bowl participant, who chaired the hearing of the House Committee on Veterans Affairs, Subcommittee on Disability Assistance and Memorial Affairs. Thank you for giving me the honor and privilege to appear before your subcommittee today to testify on H.R. 2717, a Bill introduced by my Congressman, Mike McIntyre of North Carolina, which would “direct the Secretary of Veterans Affairs to designate one city in the United States each year as an ‘American World War II City,’ and for other purposes,” including the designation of my home town, Wilmington, North Carolina, as the first to be so designated and honored. 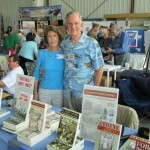 I am a retired Navy captain, military historian, author of 17 books, a Wilmington native who grew up there during the war, and chairman of the all-volunteer, 501(c)(3) World War II Wilmington Home Front Heritage Coalition, whose mission is to identify, preserve, and interpret the rich WWII legacy of Wilmington and Southeastern North Carolina. Sixty-seven years after the end of World War II, Wilmington is the only city of which I am aware that can claim the title of “America’s World War II City,” a title proclaimed by our local elected officials and Congressman McIntyre. Now we seek national recognition as the first “American World War II City” for both our region’s mighty contributions to the war effort, and our amazing accomplishments in preserving our history since then. We are totally confident we exceed the H.R. 2717 criteria required for such designation, which we present in the following narrative as the Coalition’s Thirteenth Year Progress Report, 2000-2012. Rep. Mike McIntyre (7th District, N. C.) and WWII Wilmington Home Front Heritage Coalition CAPT Wilbur Jones prepare to testify on behalf of the McIntyre Bill, H.R. 2717, before the Subcommittee on Disability Assistance and Memorial Affairs of the House Committee on Veterans Affairs, March 29. H.R. 2717, which has 66 co-sponsors, would establish a process within the Department of Veterans Affairs to designate one city annually as an “American WWII City,” with Wilmington being the first. But H.R. 2717 reaches beyond just designating Wilmington as the first “WWII City.” Most importantly, it establishes a process within the Federal Government to allow ALL cities with significant WWII history to vie for this designation – a major step in the continuing preservation of our national heritage, and long overdue before sites disappear, memories fade, artifacts are lost, and participants die. On behalf of Wilmington, New Hanover County, and the State of North Carolina, I strongly urge passage of H.R. 2717, and immediate liaison with the Senate on a companion bill to be resolved for the President’s signature during this Session of Congress. Following proclamations in 2008 by the Wilmington, North Carolina, City Council and New Hanover County Commissioners, Wilmington proudly claims this title. To our knowledge, no other city makes this claim after 67 years since the war ended. The claim is based on our region’s vast contributions to the war effort, varied war industries, all five armed forces based here, its strategic location, and the record of its residents serving in uniform. Additionally significant is our success in preserving this WWII history. In both 2008 and 2011, our Congressman, Rep. Mike McIntyre (7th District, N. C.), inserted a “WWII City” proclamation in the Congressional Record. Now we seek national recognition. 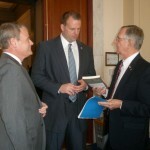 In 2011 Congressman McIntyre introduced legislation in the U.S. House of Representatives (H.R. 2717) to establish a process within the Department of Veterans Affairs to designate cities as an “American World War II City,” with Wilmington being designated as the first to receive this honor. 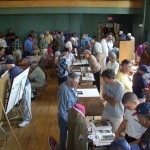 The criteria are: what did your city do to support the war effort, and what are your efforts to preserve that history? 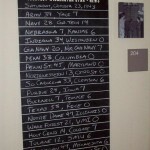 In March 2012 the bill has 36 House co-sponsors. Congressman McIntyre’s staff is working with the staffs of North Carolina Senators Richard Burr and Kay Hagan to develop a companion bill in the Senate. H.R. 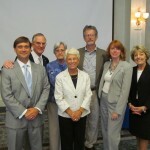 2717 resulted after attempts by the Congressman and the Coalition to identify national organizations in a position to grant Wilmington alone as “America’s WWII City.” None, such as the National Trust, Smithsonian Institution, National USO Headquarters, and the American Battle Monuments Commission, has the authority. So, federal legislation appeared to be the solution. The World War II Wilmington Home Front Heritage Coalition is an all-volunteer, 501(c)(3) corporation of organizations, agencies, and individuals collectively supporting our efforts to identify, preserve, and interpret the rich WWII history of Wilmington and Southeastern North Carolina. The Coalition is the catalyst for developing and leading such preservation efforts. The emphasis is on New Hanover County, which then was the region’s economic, industrial, financial, business, social, and entertainment hub. The Coalition operates and is administered within its By-Laws. Directors meet annually in the spring. Coalition Supporters, such as the evolving partial list on our letterhead, are organizations and individuals who help us accomplish our mission. Their support includes recognition, advisory, financial, government relations, project-related, public relations-related, and endorsements, and as volunteers. No “membership responsibilities” are asked – no dues, no meetings, no elections, no surveys, no obligations – only support. Until 1944, government told citizens to fear German sea or air attack; civilian defense drills – blackouts, air raids; rationing, food shortages; U-boats ravaged off coast; one fired on Ethyl-Dow Chemical plant at Kure Beach July 1943, possibly the only German attack on the U.S. 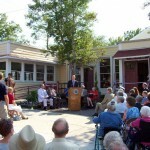 Congressman Mike McIntyre with Hannah Block and Carroll Jones at rededication of the Hannah Block Historic USO in July 2008. 5,495 units constructed (federal/local) in 7 housing projects (some still in use). A principal RR in the Southeastern U.S.; transported war material and troops; also served by Seaboard Airline RR. From Feb. 1944 to April 1946; first one at Shipyard Blvd. and Carolina Beach Rd. (historical marker), then moved to Robert Strange Park (main camp, 8th & Ann Sts. ; historical marker); detachment at Bluethenthal Field; maximum 550 German POW’s captured from Afrika Korps in 1943; caused no trouble, no breakouts, worked dairy and truck farms, fertilizer and pulpwood industries. 191 County men died, plus 57 more with County connection = 248 did not come home; three sailors KIA at Pearl Harbor on Dec. 7, 1941; men died in combat on Guadalcanal, New Britain, Peleliu, Saipan, New Guinea, the Marshalls, Okinawa; in and over Holland, Italy, Sicily, North Africa, France, Philippines, Germany, Burma, Belgium, Luxembourg. 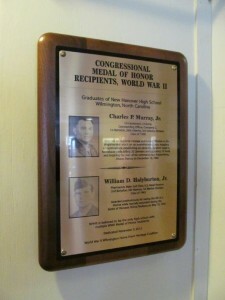 2 recipients, both graduates of New Hanover High School (Charles Murray ‘38, Army France 1944, and William Halyburton ‘43, Navy Okinawa 1945 posthumously) – believed to be only high school in country with multiple WWII MoH recipients. 2 Navy pilots awarded Navy Cross for helping to sink Japanese carrier at Battle of Midway – one was awarded total of 3 Navy Crosses; 1 Army Air Forces pilot awarded Distinguished Service Cross for Midway; 1 Army DSC recipient (posthumously) for Normandy; numerous Silver Stars, Bronze Stars, Distinguished Flying Crosses, and Air Medals. Main location at 2nd & Orange Sts., renovated and restored in 2008 to wartime appearance. $40 million raised in County in 7 drives. No planning: seat-of-the-pants, trial-by-error; housing (many private homes rented rooms to workers and military); inadequate infrastructure including few main streets/thoroughfares (army constructed Shipyard Blvd. and Military Cutoff); problems: food shortages, crowded/cramped schools, long lines for restaurants and theaters, racial segregation, administering justice, transportation, accidents; crime (“sin city”) – murders, rapes, fights, thefts, muggings, prostitution, black marketeering, moonshining. 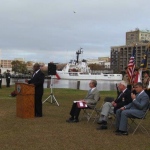 Since its founding in 2000, following its forerunner organization – the highly successful, award-winning 125-event Wartime Wilmington Commemoration in 1998-99 – the Coalition has accomplished or participated with others in accomplishing numerous projects to preserve our region’s WWII history. Our primary partners have been the City of Wilmington and New Hanover County, and organizations such as the Thalian Association, Community Arts Center Accord, New Hanover High School Class of 1943, Cape Fear Museum of History and Science, New Hanover County Schools, and Community Boys & Girls Club. ■ In 2008, completed the successful 11-year public-private partnership project to rededicate the city-owned, renovated and restored WWII Hannah Block Historic USO building at Second and Orange Streets, also known as the Community Arts Center (HBHUSO/CAC). Visitors enjoy wartime Wilmington memorabilia exhibition at "Salute to WWII Veterans Jamboree," 2009. 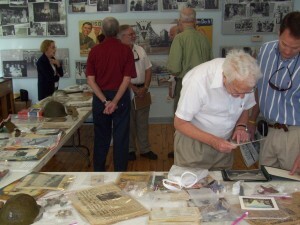 — The lobby area is restored to its wartime appearance and hosts a museum of the Southeastern N. C. home front. — The building is on the National Register of Historic Places. ■ With the New Hanover County Schools, planned and coordinated the 70th anniversary celebration (December 16, 2011) of the HBHUSO/CAC – school children created the observance through music, drama, dance, and decorative skills to a “Christmas 1944 at the Wilmington USO” theme. ■ The City Council named the Coalition chairman as the “history representative” on its HBHUSO/CAC Advisory Board, and gave the Coalition de-facto responsibility for the building’s preservation. — Exhibits of WWII Army and Marine uniforms and female hostess outfit worn at the USO; model of Liberty ship built in Wilmington. 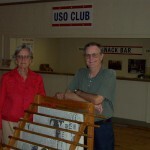 — Installed original and reproduction wartime USO furniture and furnishings, such as a newspaper rack with reproduction wartime Wilmington Star-News newspapers. ■ Planned, operated, and participated in the 2008 “Star Spangled Weekend” events which rededicated the renovated and restored HBHUSO/CAC. ■ Held an HBHUSO/CAC open house and tours during Wilmington’s “Be a Tourist in Your Own Home Town” weekends in 2010-11, and provided tours and briefings to other visitors. ■ Designed, published, and distributed throughout Southeastern North Carolina and the I-95 welcome centers three editions (approximately 100,000 copies) of the popular “World War II Heritage Guide Map of Wilmington and Southeastern North Carolina,” a self-guided map for residents and visitors of more than 50 WWII sites. ■ Placed the WWII Heritage Guide Map on the internet on the websites of the CAC, Wilmington and Beaches Convention and Visitors Bureau, and www.wilburjones.com. 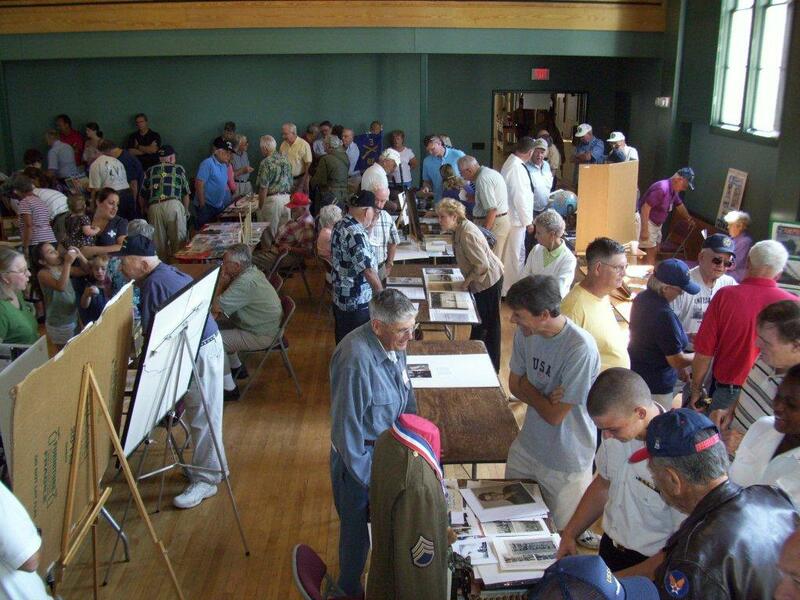 ■ Produced two highly successful “Salute to WWII Veterans Jamborees” (2005, 2009) with nearly 200 veterans and home front workers participating, and attended by more than 1,500 persons. ■ With the City, placed marker signs at both the original (Shipyard Boulevard and Carolina Beach Road) and main (10th and Ann Streets) German POW camps. ■ Requested the City Council (granted) to name its new natural park on South 17th Street as the “William D. Halyburton, Jr., Memorial Park,” honoring the 1943 New Hanover High School (NHHS) graduate and Medal of Honor recipient, a navy hospital corpsman killed in action on Okinawa. The park was dedicated in 2004. 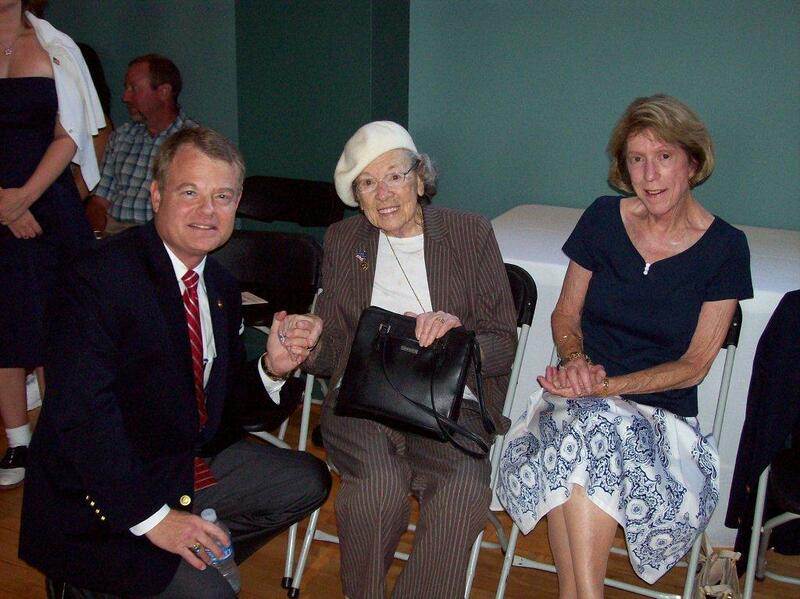 — With NHHS class of 1943, produced Wilmington Medal of Honor Day to dedicate the memorial. ■ Requested the New Hanover County commissioners (granted) name the main thoroughfare street through Veterans Park for Halyburton. ■ Produced and directed annual commemorations of the Japanese attack on Pearl Harbor, Hawaii, every December 7, at Battleship Park. ■ Produced and published HBHUSO/CAC welcome brochures. 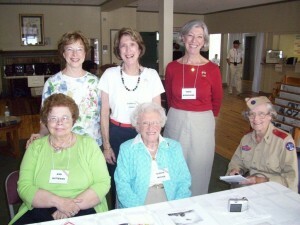 ■ Participated with the Wilmington (Downtown) Rotary Club’s international project to provide WWII history books and DVD’s, archival materials, and a computer and software for the Daughters of Our Lady of the Sacred Heart convent on Tarawa, Republic of Kiribati. 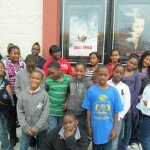 The Community Boys & Girls Club of Wilmington were guests of the World War II Wilmington Home Front Heritage Coalition at a showing of the George Lucas movie, "Red Tails," a story of the Tuskegee Airmen in combat in Europe during WWII. January 2012. 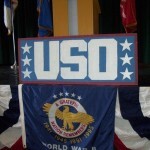 ■ Participated in planning and producing the HBHUSO/CAC’s 60th anniversary celebration (2001) and USO big-band dances. 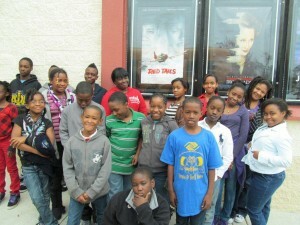 ■ Hosted 30 children and staff of the Community Boys and Girls Club of Wilmington, with snacks, for the movie “Red Tails,” about the famed Tuskegee Airmen (2012). ■ The Coalition chairman visited the Murray Medal of Honor site in Kaysersberg, Alsace, France in 2009 and 2010, and represented the Coalition at the Murray funeral visitation in Columbia, SC (August 2011). ■ While attending the 70th anniversary of the attack on Pearl Harbor in 2011, the chairman visited the Halyburton gravesite in the National Memorial Cemetery of the Pacific (Punchbowl) in Honolulu, along with the USS Arizona and USS Oklahoma memorials which honor two of the three Wilmington boys KIA on December 7, 1941: Harvey Howard Horrell, and Herbert Franklin Melton. – For radio and TV media, he has given approximately 100 interviews on SENC WWII history. – Has delivered more than 500 lectures and other presentations on WWII history to various groups globally, including schools; mentors students; exhibits his boyhood wartime memorabilia collection saved while growing up in Wilmington during the war; and leads WWII site tours of SENC. – In 2006, he received the Award of Merit for his preservation achievements from the American Association for State and Local History; in 2005, the N. C. Society of Historians named him North Carolina Historian of the Year (East). 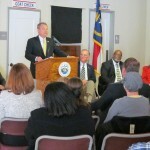 The Coalition received 501(c)(3) North Carolina incorporation in the spring of 2008. All funds received by the Coalition are converted as soon as practical to pay for projects, functions, and administrative costs. Funds are raised primarily through soliciting small private individual and organizational donations. The Coalition received three grants to fund the research, printing, and distribution of the three editions of the World War II Heritage Guide Map of Wilmington and Southeastern North Carolina. The latest was for $6,500 in 2008 from the City of Wilmington. Tax-deductible donations to support our history preservation projects can be made payable to the Coalition and mailed to P.O. Box 425,Wilmington 28402. Donor plaque memorial to my parents and sister and brother-in-law placed in lobby of Hannah Block Historic USO. 2008. ■ With the Society of the 3rd Infantry Division, in 2012 place a historical marker at Murray’s Medal of Honor action site at Kaysersberg, Alsace, France. ■ With the NHHS PTSA and Army Junior ROTC, continue re-development and expansion of the garden around the school’s Medal of Honor memorial, and host alumni reception there. 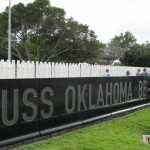 ■ Continue sponsorship and production of annual Pearl Harbor anniversary ceremonies on December 7th at Battleship Park. ■ Continue installation of HBHUSO/CAC new exhibits and artifacts – such as the just-acquired broken champagne bottle in net and ribbons which launched the Liberty ship SS Roger Moore in Wilmington in 1943 – and upkeep of existing exhibits in lobby area home front museum, including memorial plaques to the Medal of Honor recipients, and all New Hanover County men who died. ■ Continue sponsorship and production of HBHUSO/CAC veterans events, open houses, and other history and arts-related events.